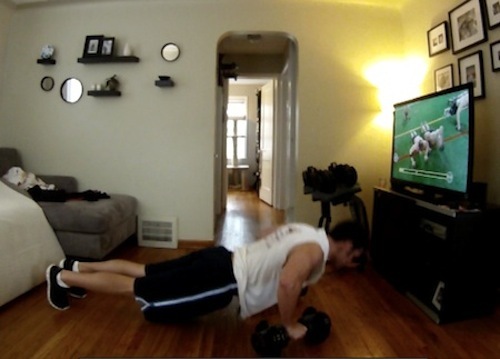 The Insanity Asylum workout keeps up with the trend from Beachbody where you don’t need a lot of space to workout in. I had a little bit of a problem in my small family room with the agility ladder so I went outside. It was summer so it was not a big deal. My issue inside was I didn’t have enough space to jump the length of the agility ladder which limited me in how much speed I could get going. I also had an issue jumping rope inside as my ceilings are low. Doing the Strength workout inside. Doing Speed & Agility outside. If you have a room in your house that’s 3 feet wider and longer than mine and tall ceilings then you’ll be ok. Otherwise you’ll only be able to do the Back to Core and Strength workout inside.